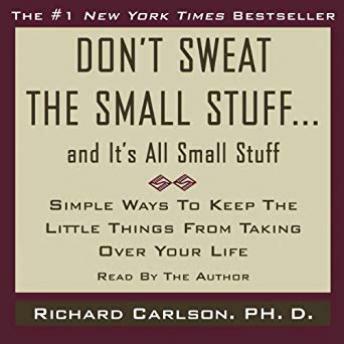 Don't Sweat the Small Stuff...and It's All Small Stuff tells you how to keep from letting the little things in life drive you crazy. Richard Carlson reveals ways to calm down in the midst of your incredibly hurried, stress-filled life. With gentle, supportive suggestions, Dr. Carlson reveals ways to make your actions more peaceful and caring, while making your life more calm and stress-free. Excellent book with lots of good advice on becoming more peaceful inside and out. I am trying to put some of his advice to use as much as I remember since I listened the first time. It does work (at least for me) to make me feel better about myself when I stop and think before I speak or act. I feel better than I would after what normally would have probably been an impulsive action or reaction. The type of things that I might blurt out leave me feeling pretty negatively afterwards, and even embarrassed. I tend to come across as very know-it-all-ish, unpredictable, short-tempered at times, disorganized, self-centered, and fairly impulsive, I think. I've always sweated the small stuff. I've always been meticulously detailed oriented, organized, caring, compassionate, empathetic, and actually very calculating (despite what others may think! :) Most of the people I can think of on my paternal side of my family are the same way. We're generally pretty intelligent Type As with a low tolerance for frustration or what we might consider B.S. I think most of us are pretty high strung and tend to seek perfectionism in some way or another. It can make life fairly miserable at times. Instead I'm really trying to not be so.. well.. like I seem to be the past few years. As I get older, the more pronounced these traits have become. I hope it continues to help me calm the inner storms and to make me a little more pleasant to be around. I definitely recommend it. Rest in Peace, Dr. Carlson. :-) Thank you! I listened twice and probably will a couple times a year. Good stuff here even for those who don't consider themselves stressed. Thought provoking...an excellent thing to remind yourself of the small things that add up to become big things and to keep your perspective...listened to over and over. Much of it are things you have probably heard before. Dr. Carlson has a way of stating the information in a very sensible way. It's the kind of advice that is helpful to listen to every so often to remind us of what's important in life! I'll rent it again. Although I didn't find Richard's voice stimulating, I did find his ideas to be. If you struggle with patience, tend to rush, and are generally prone to being frustrated, like myself, then you'll most likely enjoy (and be challenged by) this book. I identified with nearly every section, and realized that a lot of my so-called character traits (for which I formally dealt with by saying, "That's just the way I am) are actually daily, lifestyle choices. Now I know that I AM actually capable of choosing and living differently. This set was very helpful to me. I tend to be an A-type who gets frustrated quite easily. Patience isn't one of MY virtues. Dr. Carlson, while sometimes a bit too chipper, definitely got a point (or two) across to me. Very helpful. I plan to check this one out again in 6 mos to get recharged. Recommend this for A-types who don't necessarily enjoy being such.